In Part One we looked at how Adobe Premiere Pro handles exporting media to various codecs. In this part we’ll look at how an Adobe Premiere Pro project is exported to different applications for further processing. I have already covered this in the Adobe After Effects Import Guide, so I won’t be going into this again. In brief though, all you have to do is open the Premiere Pro project (*.pproj) in After Effects. You’re done. Render a final DPX image sequence and then import that into Speedgrade. Use the ‘Send to Speedgrade…’ option in Premiere Pro. 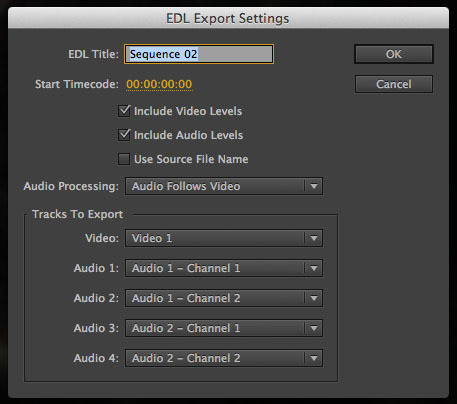 Export an EDL and import that into Speedgrade. For a quick overview on how to import projects into Speedgrade, read the Adobe Speedgrade Crash Course for Beginners. In it, I also explain how Speedgrade prefers DPX above anything else. If you know you’re not going to be coming back to Premiere Pro, then the simplest solution is to just create a sub-master DPX image sequence from Premiere Pro as shown in Part One. Import this image sequence into a new project within Speedgrade and master from there. Go to File > Send to Adobe Speedgrade…. You will be asked to specify a location on your drive, and a new Speedgrade project will be created (*.ircp). One more thing happens. Your clips are converted into DPX image sequences, and each clip is written to its own folder. The entire audio is exported as one big WAV file separately, and all this goes into the folder you specified for export. You don’t have to worry about choosing the right project settings in Speedgrade. You can come back to Premiere Pro when you’re done, in case you want to add titles, etc. Even if you render a full DPX image sequence as shown in the earlier method, you can still come back to Premiere Pro, but you’ll no longer have clips separately, and finding one section to make adjustments or whatever is painful. If all goes well, it should work. In both of the methods above, you are forced to render your video as DPX image sequences. What if you don’t want to do that? What if you want to continue grading on your native files (maybe they’re already good enough, like Proroes, TIFF, or whatever)? The settings are straightforward. The EDL format is CMX 3600. 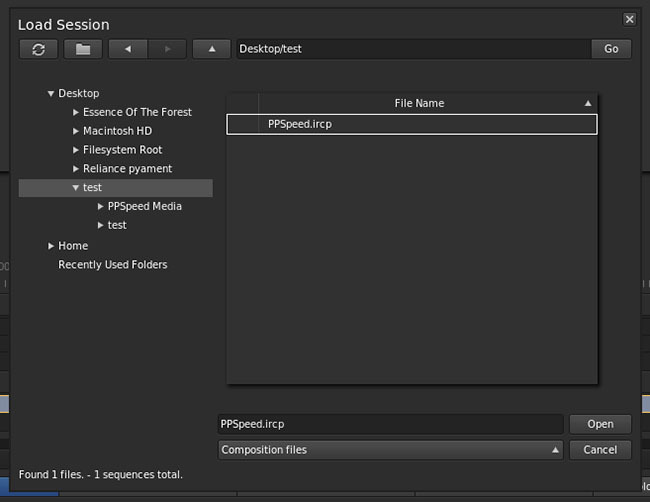 In Speedgrade, you click on the Open Speedgrade Project icon (top left) and select the saved *.ircp file. Make sure you have EDL Conform files selected, and not Composition files. You’ll need to find the original media files in your browser. Choose Sequences from folder + sub-tree, and you’ll see all the supporting sidecar files, not just the video. In Reels, click Load from Desktop, and the media should show up. How well does this work? Not very well, I’m afraid. I tried it with simple edits and still had major problems. Suffice to say I can’t recommend this without a word of caution. Instead of wasting time simplifying and flattening your timeline to get the EDL to work, transcoding it to DPX might be a far better option. Please test either workflow before you go ahead. Go to File > Adobe Dynamic Link > Send to Encore. You must have Encore installed for this option to show up, and it must be the same version as Premiere Pro (E.g. if one is CC and the other CS6 it won’t work). The clips can be used untranscoded, and you can create Blu-ray and DVD media with Encore, with the highest quality possible. The other method is to export an MPEG-2 DVD (or H.264 Blu-ray equivalent) file but I don’t recommend this. A simple test between this method and the one above should tell you why. In general, the most important thing to remember when going to a disc-based media is to first do bit-calculations. This means, write down every thing that needs to go into your disc (including chapters, menus, audio tracks, the making, whatever) and allot the bit rates for each. You’ll eventually get the amount of space your actual video can take, and this will give you the ideal bit rate for it. Trust me, this is better done in Encore. When you’re new to this, be prepared to burn a lot of test-discs. I’ve burned as many as 20 DVDs on one project, trying to get it right. To export projects into Resolve, you can use either EDL or XML. Both work okay. Most effects aren’t bound to get through, so it might be a good idea to flatten your timeline and make things as simple as possible. Also take note of the codecs that both applications support. To know more read the DaVinci Resolve Crash Course. To export projects to Scratch, you can use either EDL, AAF or XML. The simplest solution is to export each track as an EDL, or use XML instead for the entire sequence. I haven’t worked with Scratch yet, so I can’t go into more detail. That’s it! I hope this quick guide has given you enough information to decide for yourself whether Adobe Premiere Pro is the right tool for your workflow or not. Always test a workflow thoroughly before committing to it. Don’t assume something will or will not work – that’s not the professional way to do things.